As of this writing, all of their jerky is sold in "bites", bite-sized pieces, and in a chopped and formed product. Only recently did the company get a website going with online purchasing. In addition to this "Mild" variety, they also offer Medium, Hot, Extra Hot, and Teriyaki varieties. Beef, dextrose, sugar, salt, spices, butter flavoring, natural hickory smoke flavor, monosodium glutamate, hydrolyzed soy protein, onion, garlic, celery seed, caramel color, onion powder, garlic powder, cilantro, sodium nitrite. The first thing I taste from the surface is a smoky flavor, followed by a light sweetness. A bit of saltiness starts coming in later. The chewing flavors start with some natural meat flavors, along with an increased saltiness, and a blend of spices including a noticeable garlic. For being dubbed "Mild", it seems to be so, at least in that it's not hot. But it's not mild on flavor. It seems to have a strong flavor intensity as well as a strong flavor complexity. The primary flavor I notice above all else is a saltiness, which I'd rank at a medium-high level. But there's a spice blend that competes pretty well, offering mostly a garlic flavor, but just looking at the ingredients list, I can identify the onion, and I believe I taste some black pepper too. The natural meat flavors are there, but it's more like a cured meat flavor, comparable to what you'd find in meat sticks and summer sausages. The butter flavoring listed in the ingredients seems quite noticeable too. Combined with the salt and seasoning, it almost has that sense of eating buttered popcorn, but in a jerky form factor. In fact, it gives this jerky's overall flavor some extra body. To sum up the taste, what you're going to notice in this is a medium-to-high saltiness, with a good deal of garlic & onion seasoning, a cured meat flavor, all wrapped up in a buttery flavor. 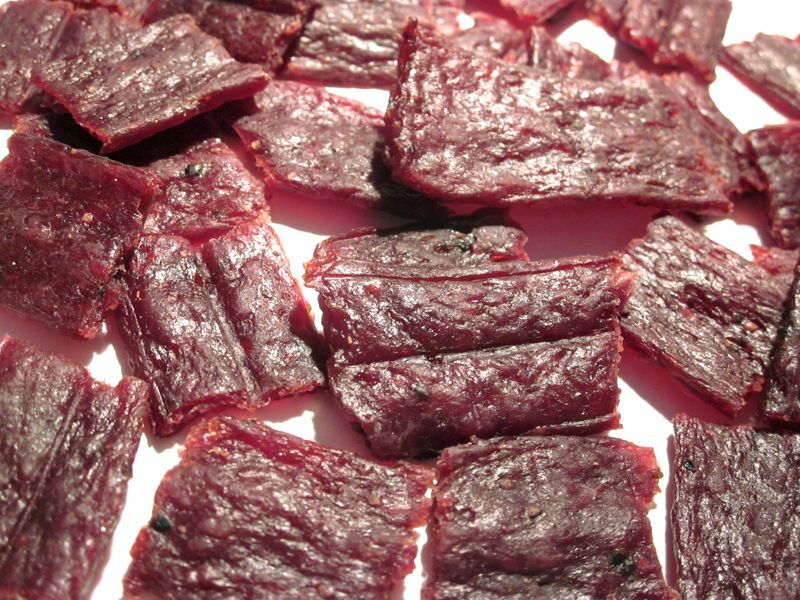 This is a chopped & formed jerky, cut up into small, thin, bite sized pieces. For kids, each piece might actually be "bite sized", but for me I find eating two or three at a time just right. 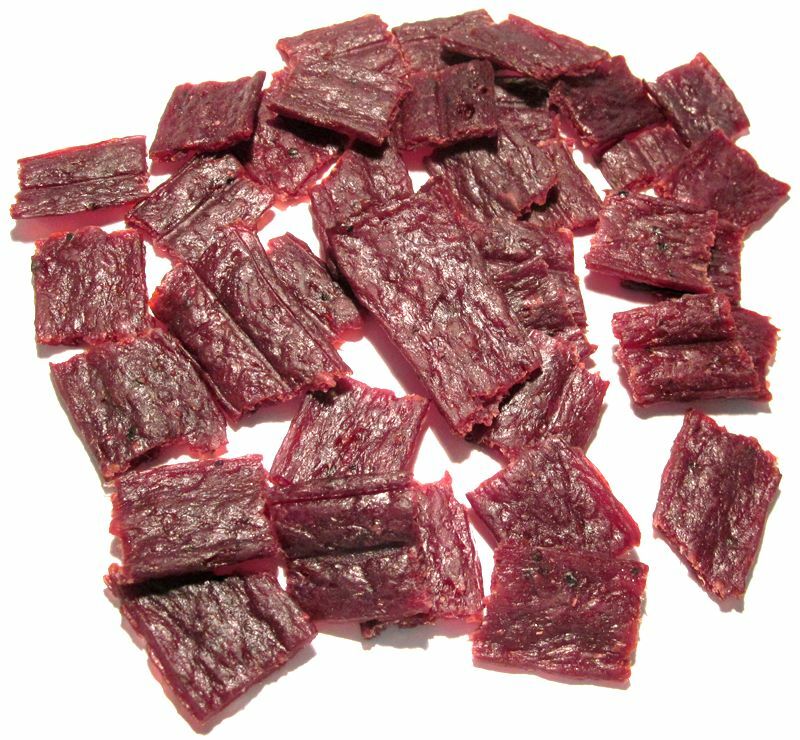 But as a chopped & formed jerky, it seems void of any hard bits of material and I didn't see any chunks of gristle or cartilage. It seems to be mostly all meat, except for visible bits of seasoning mixed in. 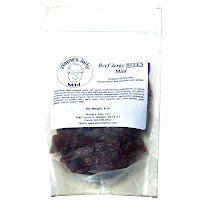 Wayne's Jerky sells this Mild variety from its website at a price of $6.95 for a 4oz package. According to their website, if you bought four packages the shipping comes out to $10.70 for a total of $38.50. That works out to $2.41 per ounce. 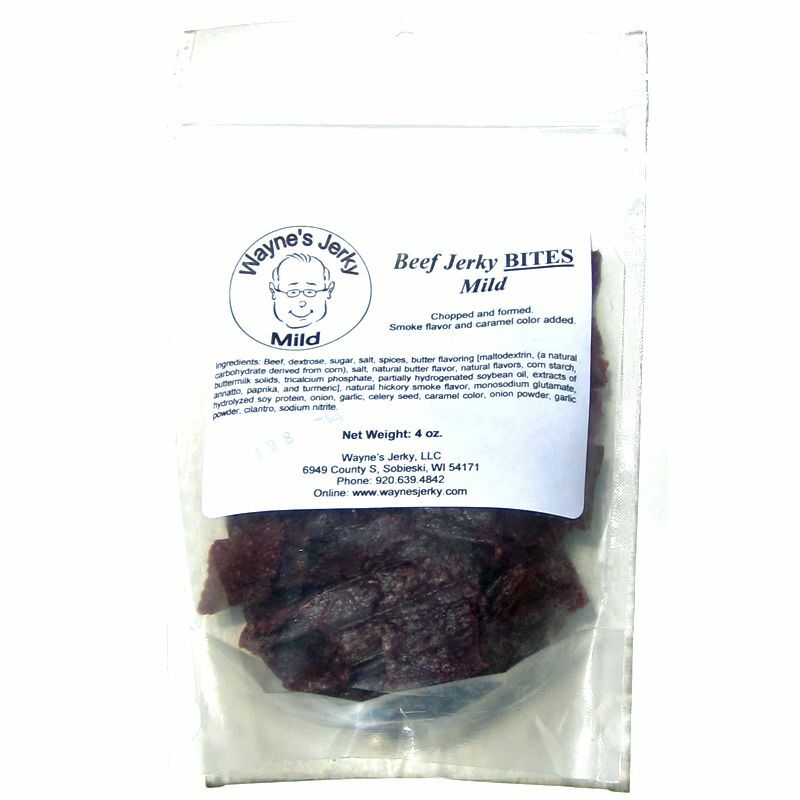 This Mild variety from Wayne's Jerky provided what I thought is an excellent flavor, marked primarily with a salty, garlic & onion seasoning, plus a noticeable black pepper, and wrapped up in a buttery flavor. There's a cured meat flavor, comparable to what you might find in a beef stick or summer sausage, and some light smokiness. It didn't really chew like meat, initially feeling rather rubbery, and then chewing down to something crumbly. It can also be somewhat laborious to chew. Each piece seems too small to eat one at a time, and so I ended up eating two or three at a time instead. But that only increased the chewing resistance and it made it more laborious. It might be easier to chew if I sucked on them first except there's little surface flavor on these. All the flavor comes out of the chewing and just begs you to chew right away.